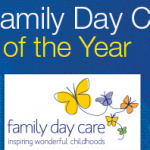 Family Day Care Australia has announced the 2013 Excellence in Family Day Care Awards. They are looking for those who demonstrate a commitment to ongoing quality improvement, innovation and a commitment to quality care and education based on the core values of family day care. Through the awards program they hope to acknowledge and share the touching stories about the amazing bonds shared between family day care educators, coordination units and the families they work with. Click here to nominate your Educator. Click here to nominate Kids at Home. FDCA are looking for educators who demonstrate a commitment to ongoing quality improvement, innovation and a commitment to quality care and education based on the core values of family day care. We invite families to tell us, in their own words, what makes their educator such an integral and special contributor to the lives of their children and their early childhood education. Through the awards program we hope to acknowledge and share the touching stories about the amazing bonds shared between family day care educators and the families they work with. This year FDCA will be presenting State and National Coordination Unit of the Year Awards to recognise and showcase the valuable work done by coordination units for their educators and communities all around Australia. Tagged 2013, family day care, family day care australia awards, FDC, FDC Australia, FDCA Awards, Kids at Home.